What's out: Payday lenders. 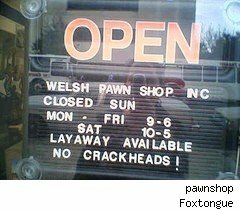 What's in: Pawn shops. November was a tough month for the payday lender business, as Arizona and Ohio joined a host of other states imposing caps on its fees that will effectively drive them out of business. As a result, the unbanked, it need of quick cash, are being forced back to an ancient alternative, the pawnbroker. The main difference between payday lenders and pawnbrokers is collateral. Pawnshops require you to give them some of your personal property, often jewelry, musical instruments, or electronics, which they hold until you pay back the loan. Payday lenders loaned without collateral, except the promise you'd make good, much like loan sharks of old, without the threat of arm-breaking. Payday lenders drew public distain for charging interest rates upward of 400% annually, although the industry argued that, given the usual short-term nature of the loan, this is an unfair description. Both payday and pawn shops would prefer to compare their rates to the late fee on a credit card ($39 on some), or a utility, or the cost of a bounced check. Pawnshops, according to "How Things Work", will loan roughly 33% of the pawned item's retail value. The big-screen TV you bought for $750 might be worth $400 used, so the shop might loan you $133 on it. While the interest charged, and other 'fees', are capped differently in different states, the typical terms might be 2% interest plus 20% in other fees, payable in 30 days. In other words, to get back your TV you'll need to repay $133 + $2.66 interest + $26.60 in fees, or $159.86. You could also roll over the loan for another month by paying the $29.26 interest and fees. This is obviously a recipe for disaster, in the long term. Worse, however, is the scenario in which you can't afford the payment to extend your loan. Taking the above example, should you default, you will end up paying $400 for $133 loan. Therefore, when you find yourself walking into either a payday lender or a pawnshop, you really should take it as a sign your personal finances have bottomed out, and seek professional help. Paying these kind of fees will only serve to keep you trapped in a cycle of debt.